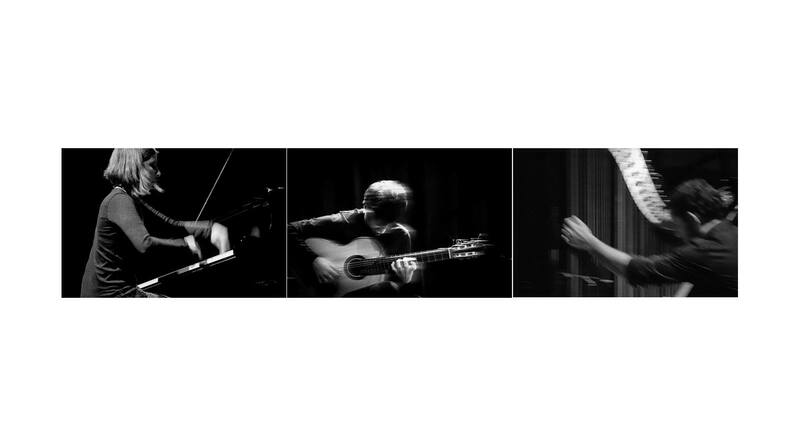 POWERTRIO is a Portuguese ensemble dedicated to composition/interpretation of contemporary music and also to improvisation. Started in 2007 by three composers/interpreters with classical background and vast experience in other musical genres. This rare instrumental combination allowed POWERTRIO to develop a unique sound, taking advantage of the idiomatics of each instrument as well as of the vast “cameristic” possibilities of this ensemble. Aware of classical music’s legacy, POWERTRIO uses and subverts contemporary musical archetypes, logics and solutions questioning and seeking integration of crossmedia resources. In a place where composition and spontaneous musical gestures battle/clash/compete, POWERTRIO performs (onstage) a narrative based on intensity. The audience is invited to experience a place where dimensions morph and where scale space and time notions are manipulated revealing a peculiar sensorial path. For that purpose POWERTRIO approaches the piano, the guitar and the harp with no restrictions!